The benefits of battery farming are all about money. Farming free range hens, producing eggs in a more natural and humane way, is far more sustainable. And happy hens make healthy eggs. Battery farming has a lot of advantages - for the farmer. There has been much written about factory farming. I will keep most of this page to a brief exploration of the evils of caging laying hens - and look at the effects this has on our health. There are also some details of how such farms impact upon the wider environment and a very brief review of the alternatives - free range and perchery systems, etc. First, a brief look at what's wrong with batteries from the hen's eye viewpoint. Battery farms are vectors for disease. Laying hens are overcrowded to the point of stress. The laying hen is typically confined in a cage half a metre square (500mm x 500mm) which it shares with three or four other birds. (Standards vary - the allotted space for caged hens may be even less in some countries.) It stays put for its entire productive life of 1, or 2 years. There is barely enough room for the birds to turn around. Laying hens stand on wire mesh all day and night so their feet are often calloused and sore. They have no stimulation other than the other birds in their cage - so hen-pecking and aggression are common. De-beaking and toe trimming are therefore routinely practised. These procedures can cause pain and stress and lead to infections. The de-beaking of chicks will be banned in the UK from 2011 and is already banned in Finland, Sweden and Norway. But it is still common in most battery farms and hatcheries. Even so, birds rescued from factory farms are often almost denuded of feathers. Sometimes birds are deliberately stressed to provoke laying - their feathers drop as a consequence. To stop the spread of disease from overcrowding and insanitary conditions, antibiotics are routinely supplied with feed. They are not alone in using this procedure - it's common practice. This is true in both the US and the UK, though some UK male chicks are gassed. 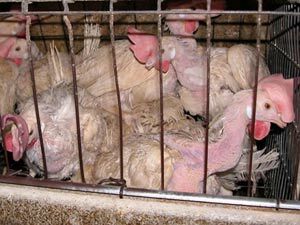 According to www.viva.org.uk upto 2 million battery hens die in their cages in the UK alone. For the ones that survive after one or two seasons of intensive laying they are shipped off to be slaughtered. What's good about battery farmed egg production? The reality of battery farming - traumatised, abused hens. From my standpoint, absolutely nothing! However, lets play Devil's advocate and take a quick look at the arguments in favour of battery farming of laying hens. Battery farms produce saleable eggs intensively and therefore cheaply. This means that people on low incomes can afford enough protein (but there are other more, humane ways to achieve this). The eggs are checked for defects and waste eggs (broken shells etc) are used for the animal feed industry. Chicken manure is collected and often sold for fertiliser. The birds are - usually - warm and well-fed and frequently checked by factory staff. Disease is kept low by the use of antibiotics. Since the early 20th century this type of egg production system has been used throughout much of the world. In the UK today battery farms are the most common way of keeping laying hens. Battery cages for laying hens will become illegal in the EU from 2012. Many will be replaced by a "enriched" and "colony" systems which are only a little better. "Enriched" cages tend to be slightly larger and have a basic perch but are still woefully inadequate. Many farmers are dragging their heels about these reforms and trying to delay them further. The whole system of battery farming chickens is inhumane as it denies the animals any quality of life. They don't get to scratch in the dirt or sit in the sun. They cannot take dust baths to clean their feathers. They are in the stench and noise of an artificially lit shed day and night. They have no access to natural foods such as worms and insects. Their diet is usually highly grain-based and often includes meat residues from other intensively reared animals, including chickens. Sheds can be unbearably hot in summer as the ventilation fails to keep pace with the heat; thousands of birds die from overheating each year. Animal welfare is low down the priority list on many of these "farms". Birds are overcrowded, stressed and traumatised. If you take time to look at pictures of battery farming and hens which have been rescued, you will see that there is no possible justification for this systematic abuse of living creatures. Many pictures are deeply shocking; the one shown here above gives a moderate idea of the sad lives of these birds. If you are thinking of keeping chickens do consider helping a few rescued caged hens. I'm told they can often recover and become productive, happy hens eventually, after a few months of good care. Some chickens are raised in a deep litter, perchery or barn system. These chickens may not get to go outside but they have space to move about in large sheds, often with natural light. They are free to scratch the dirt and socialise with others. They can often forage, stretch their wings and perch properly. This system makes a workable compromise which many feel is acceptable. It is clearly far better than cage living as found in battery farming but still far short of the ideal conditions for happy hens and top quality eggs. Another system which people use for a relatively natural approach to egg production is the "chicken tractor" or movable ark. Yes, the hens are enclosed in a relatively small area but they are outside and have access to fresh ground each day on which to forage. They help the farmer or horticulturalist in keeping down pests and they enjoy a largely natural diet. Hens managed in this way should usually be happy and fit. Some smallholders and homesteaders may combine this method with a free-range approach for some of the time. This type of system allows a certain degree of intensive farming; hens get access to fresh pasture and more can be accommodated than if they were just let loose on a field. They have light, air, exercise and shelter but they are also safely contained against predators. Hens raised on battery farms often produce poor quality eggs. Laying hens are often so short of adequate calcium for egg production that they lose calcium from their bones. This can lead to other problems such as having problems standing up. Factory produced eggs are bland and sometimes taste of fish - (fish waste often goes into the feed). Genuine free-range eggs are usually bursting with flavour, especially where laying hens have had free access to diverse pasture and woodland. However, not all free-range eggs are up to the mark. More on this below. Barn or perchery eggs may have raised levels of chemical contamination from the wood shavings treated with pentachlorophenol which are sometimes used as bedding in some areas. Pentachlorophenol is no longer authorised for use in the UK. People often argue that there is no real difference between free-range eggs and battery farmed eggs. Circumstances alter cases and some battery farmed eggs are rather better than others. Same goes for free-range and perchery eggs. Some free-range systems are still crowded and relatively intensive and may even be downright fraudulent - not free-range at all. Nevertheless, anyone who has eaten well-produced eggs from healthy birds raised in a humane and relatively natural way will testify to their superiority. Please see The Best Eggs for Healthy Nutrition for more on this. Battery farmed eggs often contain a strain of Salmonella called enteritidis. This bacterium found started appearing in eggs about thirty years ago. Infection with Salmonella is still a risk. For this reason, eggs used in non-cooked foods (e.g. mayonnaise) are often Pasteurised and members of the public are advised against eating raw eggs. The dangers are particularly acute for people with chronic illnesses, the very young and the elderly. Free range eggs may also contain Salmonella bacteria but it is less common. One study showed a contamination rate of about a quarter that of battery eggs. One reason for this is simply that flock sizes are smaller. Also hens have more space on free-range farms, so birds are less likely to cross-contaminate. Battery farms, where overcrowding is notorious are hard to keep clean; birds are in constant close contact with each other. Birds which die from whatever causes may sometimes lie in their cages for hours or even days, alongside other live layers. It's worth noting that in the US there is still no agreed official standard for free range eggs. Wherever you are, it is certainly worth checking as much as possible about the origins of the eggs you eat. In the US free-range eggs are called pasture-raised eggs. In Britain there are strict guidelines. Just how healthy and safe a free-range egg is depends upon many factors: the quality of the supplementary feed; the quality of the land form which they forage; the cleanliness of the egg packing, storing and cleaning process, to cite just a few factors. There have been claims that free-range eggs contain dioxins and other toxic chemicals because the birds are more exposed to harmful chemical sprays used by farmers. This may be hard to refute where birds are raised in a landscape dominated by the agro-chemical industry. For this reason alone, organic free-range eggs may be the better choice. Hens from free-range and pastured flocks may also suffer from intestinal worms. However, they are unlikely to be given routine medication with their feed. Free range on some farms may not amount to much. Free range eggs attract higher prices so there is plenty of motivation for some unscrupulous farmers to stretch the truth. Free range is sometimes defined as "having access to outside areas". But if conditions inside are overcrowded and the outside area is small, less assertive hens may not make it outside much, if ever. Hens are notorious for their "pecking order" after all. Sometimes the outside area for the hens is a bare patch, with almost no nutritional possibilities. Farmers have be known to call their eggs free range when the outside area is concrete! Clearly free range eggs should mean pastured eggs - i.e. eggs from hens which have free access to open pastureland or to areas of pasture which are frequently changed. Or even better it should mean free access to wooded and natural areas, where abundant foraging opportunities are to be found. You can find some beautiful free-range eggs in some of the better supermarkets. Genuine woodland eggs are some of the very best I've tasted. They are worth the extra price on taste alone but it's heartening to think how birds reared this way enjoy a healthy life in fresh air and sunlight, living as close to natural conditions as possible.